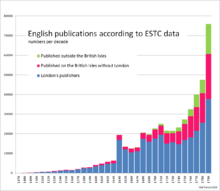 ESTC title count 1600–1799. The ups and downs in phases of political turmoil are clearly visible, particularly the sharp rise of the title output following the abolition of the Star chamber in 1641. The English Short Title Catalogue (ESTC) is a union short-title catalogue of works published between 1473 and 1800, in Britain and its former colonies, notably those in North America, and primarily in English, drawing on the collections of the British Library and other libraries in Britain and around the world. It is co-managed by the British Library and the Center for Bibliographical Studies and Research (CBSR) at the University of California, Riverside. The database is freely searchable. The ESTC began life as the Eighteenth-Century Short Title Catalogue, with the same abbreviation, covering only 1701 to 1800. Earlier printed works had been catalogued in A. W. Pollard and G. R. Redgrave's Short Title Catalogue (1st edn 1926; 2nd edn, 1976–91) for the period 1473 to 1640; and Donald Goddard Wing's similarly titled bibliography (1945–51, with later supplements and addenda) for the period 1641 to 1700. These works were eventually incorporated into the database. ^ "English Short-Title Catalog (1473-1800) North America". University of California. Retrieved 2007-03-22. Snyder, Henry L. and Michael S. Smith (eds.) The English Short-Title Catalogue: past, present, future. New York: AMS, 2003. Alston, Robin. The Eighteenth Century Short Title Catalogue: a personal history to 1989. This article about a literary website is a stub. You can help Wikipedia by expanding it. This page was last edited on 27 December 2018, at 20:31 (UTC).